Here in Asia, we're still mulling the implications for the continent after the presidential victory of Donald Trump. It was as big a surprise in this region, as it was to the U.S. pollsters and media that read the situation in such a wrong way. 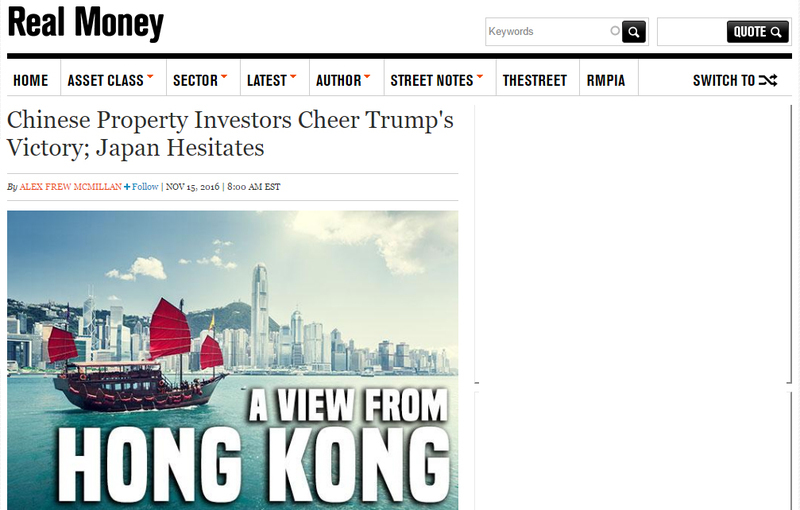 Trump's election has had an immediate positive effect on Chinese investors, East-West Property Advisors said, citing a survey that it conducted of 500 mainland Chinese professionals. East-West, which links Chinese investors with U.S. property agents, said 53% of Chinese people are now more likely to invest in U.S. real estate than before the election. Only 16% of those surveyed said they are now less likely to buy U.S. property. Chinese citizens are keen on striking business deals that help build their wealth, East-West said. Those surveyed see a similar business-minded personality and strong negotiator in Trump. "They do believe that the new President Elect will endeavor to make the U.S. economy better using his business negotiation skills," the company said in announcing its findings. "Principles and ideologies will be less important compared to expected business returns."